Kittur Rani Channamma Residential Sainik School for Girls, Kittur formalizes agreement with Saginaw Township Schools and Saginaw Valley State University. Kittur Rani Channamma Residential Sainik School for Girls, Kittur entered into a partnership with Saginaw Valley State University and Saginaw Township Community Schools during a signing ceremony held on Friday, Sept 12. Saginaw Valley State University, Saginaw Township Community Schools and Kittur Rani Channamma Residential Sainik School for Girls, Kittur have reached an agreement for various faculty and student exchange programs aimed at increasing learning and cultural understanding. 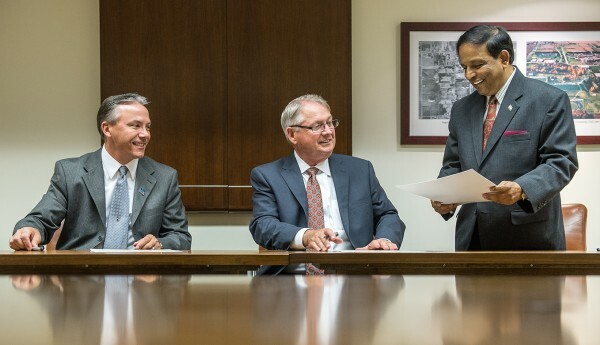 The memorandum of understanding was signed by Donald Bachand, president of SVSU; Doug Trombley, superintendent of Saginaw Township schools; and Mahendra Kanthi, chairman of the Board of Governors for Kittur Rani Channamma Memorial Committee. Details of the agreement call for the three educational institutions to share teaching and learning approaches that are considered best practices, to work on joint research projects, and to provide opportunities for students and faculty to travel abroad and experience different educational practices. SVSU and Rani Channamma have participated in a similar arrangement with Carrollton Public Schools for several years.